The Holiday Property Bond could do as much for your quality of life as it has done for many thousands of families who have already invested. That's why we invite you to get in touch with us in any of these 3 ways and please don't forget our unique 'Money back promise' and 'interest free loan' options. that we offer you a 'Money Back Promise'! If you take your first HPB holiday within three years of investing and are not, for any reason, entirely happy, you can apply to cash in your HPB investment within 14 days of your return. Whatever the encashment value, the parent company of the issuer of HPB will make up any difference so that you get back the full amount of your original payment, including charges. This offer applies to a holiday at any HPB owned property which is taken by at least one of the Bondholders themselves. Full details of the offer will be provided before you invest. 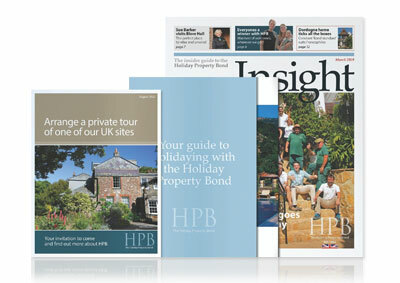 Please read "Holiday better with HPB" and then we will be delighted to send you our brochure, including our property portfolio, along with our full length DVD introduced by Bondholder Sue Barker and a list of forthcoming Open Days and Exhibitions. See the beautiful holiday homes and magnificent locations where you can spend your holidays as a Bondholder. Your local HPB representative will be happy to call or meet you at a convenient time and place for an informal chat. Simply fill in your details and we'll do the rest. Most of our representatives are Bondholders themselves and all have visited a number of Bond sites. The representative will give you all the information you need and then leave you to make up your own mind. He or she will talk to you about your holiday requirements and what level of investment is needed to secure the kind of holidays you want. iBy giving us your post code we can find a representative near you. One of our representatives will contact you using the information above. Attending an Open Day at an HPB holiday location is an enjoyable way to see what HPB has to offer. Just turn up and stay as long as you wish – there is no need to make an appointment. The representatives will introduce themselves and answer your questions. You will also be invited to inspect the site and see HPB’s high standards for yourself. Alternatively, you are welcome to attend one of our Exhibitions at a hotel near you. You can chat to one of our representatives, ask your questions and watch our complete DVD 'travelogue' of HPB locations.